Bach Ventures Ltd Outdoor Pursuits CentreLooking for a new experience or want to broaden your current knowledge? We can help provide you with that opportunity, so whether you wish to be guided around the hills, try kayaking or sea kayaking, rock climbing and abseiling or adventure activities such as gorge scrambling or coasteering we're happy to oblige! Looking for a new experience or want to broaden your current knowledge? 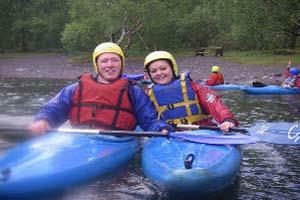 We offer a variety of courses in kayaking, sea kayaking, rock climbing , gorge scrambling and coasteering. £140 for 2 adults for a 1 day course. Our two day courses are £130 per person. Driving from Caernarfon; Pentre Bach is to be found between the villages of Waunfawr and Betws Garmon. Come out of Waunfawr, past the pub then after two bends on the straight on your right hand side you will see the sign post "CAMPING BARN" (OS Explorer 17 531579). Take the A4086 then A498 to Beddgelert. Follow the A4085 towards Caernarfon. Pass through two villages; Rhyd Ddu (3.5 miles) and Betws Garmon (5 miles). This village is split, continue past the village church over a bridge and past a row of cottages. Pentre Bach is then the first entrance on your left and is sign posted "CAMPING BARN".